Focusrite released new 2nd generation models of their popular line of Scarlett USB audio interfaces earlier this week. Among the new features on the 2nd gen Scarlett interfaces is the added support for higher sample rates and claims of “super-lower” latency. 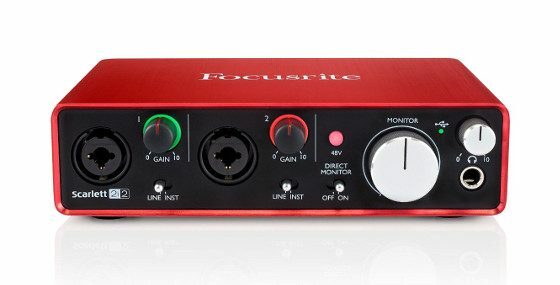 I’ve been using a first gen Focusrite 2i4 since the beginning of the year. It works well and I really like it but I wanted to see how the new models compare so I ordered a Scarlett 2i2 to test out. I’ll post a comparison between them and a review of the new 2i2 next week but for now I just want to focus on the latency differences between the two generations. Getting lower latency is really important for certain kinds of projects, so it’s a pretty big deal when it comes to getting an audio interface. So far my preliminary tests indicate much lower overall latency with the 2nd gen Focusrite Scarlett interfaces than the 1st gen models. Update: It turns out the 1st gen Scarlett interfaces can work with the 2nd gen drivers for the same low latency settings, although they won’t work at the higher sample rates but the numbers are the same up to 96kHz. Also here’s the link to the full 2i2 vs 2i4 comparison review, along with the 2nd gen 2i2 review. Update: Focusrite released new updated drivers for the 2nd gen model that changed the latency numbers that were originally posted here (see section below). The latency numbers are a bit higher with these drivers but they work much better and it’s still an improvement over the 1st gen models. Below are the original latency numbers that were posted using the first set of drivers for the 2nd model, which didn’t work very well at higher CPU usage levels. But it does illustrate how low they can get the latency with these models. Using a current project that I’m working on as an example, the 1st gen 2i4 and 2nd gen 2i2 use the same amount of CPU (about 45%) at the same 48kHz/64 samples setting, but the overall latency is less with the 2nd model, so you can use higher sample rate settings with the 2i2 and still have low enough latency to use less CPU power. For example, the 2i2 at 48kHz/128 has 10.5 ms of latency, still 1.9 ms lower than the 1st gen 2i4 at 48kHz/64 samples, and the overall CPU hit is much less at 128 samples (roughly 30% for the same project, so about 15% less with my particular setup). Everything comes with a price. I can run the 2i4 at the highest settings with no issues whatsoever. The 2i2 introduces a lot more crackling issues at certain settings. I haven’t had much time to test yet but it’s running well at 48kHz/64 samples. 32 sample rate settings are less reliable and a lot more prone to crackling. And the 176kHz and 192kHz settings are pointless; you can’t use much more than a DI bass with that kind of CPU hit. Update: Luckily the new drivers for the 2nd gen 2i2 fixed the crackling issues so that’s no longer a problem. The crackling isn’t necessarily because of your drivers. If your CPU is the weak link, then you’ll get crackling at very low sample rates no matter what interface you’re running. Running at 96kHz and 128 samples with the 1st gen 2i4 is as smooth as butter. The important role has a driver (computing the sound, using registres|memory|buffer types and other). Focusrite in 1st generation has really BAD drivers on windows (with mac this moment is better). When I move the slider of latency in standart focusrite driver to 1 position, it has ~6ms latency on input and ~7 latency on input. So badly digits. Hi! Even knowing all that, would you totally not recommend 2i2 1st gen? I’m buying a 2i2 1st gen from a friend and I would like to know if these latency issues could create a big problem when I’m recording or it’s just a “plus” that companies put up on their products to raise the prices. Thanks! Personally I had really good luck with the 1st gen driver but the latency was an issue for me when recording DI guitars. It can also be a problem if you’re doing stuff like recording virtual instruments in real time. Unless you’re doing those type of things the latency isn’t a big problem. Otherwise it’s definitely worth the extra cost to get a 2nd gen, especially since Focusrite still hasn’t updated the 1st gen drivers to have lower latency like they said they would five months ago. I got a new notebook with an i7 and with 128 samples and 48khz its crackling like hell! 256 samples are ok, but over 22ms latency “overall”. my old steinberg ci2+ with usb1 runs better! Thanks for the information. I’m looking for a low latency USB interface which I’ve always assumed was RME only. But it looks like the Zoom UAC series has recently matched RME’s USB latency performance and now Focusrite…and at a fraction of RME’s cost. This is AWESOME news and I’m looking forward to your full review of the 2nd Gen Scarlett. Studio 192 by presonus is one of the best interface under 1000 bucks. 1.5 ms .
hellloo Nathan.. im about to purchase scarlet usb interface.. i hav windows 10 i5, im planning to record my vocal with guitar and sometimes piano connected to it! amoung 2i2 and 2i4 which one u suggest for me? what are the main comparison between them.. please so help!! The link to the main comparison review is in the article and it explains the differences between them. Does the 2nd Gen interface handle hot input source better than the old 2i4? I see that the new 2i2 doesn’t have a pad like the 2i4 does. I want to record guitars that have humbuckers and single coils. The 1st gen 2i4 handles hot pickups fine thanks to the pad button but the 1st gen solo and 2i2 can not handle active pickups. But they did fix that with the 2nd gens. Even Seymour Duncan blackouts work well without clipping. Thanks, now I just have to decide whether to get the old 2i4 for the midi capability or go with the new 2i2. They cost about the same at this point. Just a heads-up, Focusrite released new updated drivers for the 2nd gen models today and now I’m not having any crackling issues with the 2i2 even running the CPU over 90%. The latency numbers aren’t quite as low with these drivers, however, so I’ll have to update this post with the new numbers tonight. Hi Nathan I need your help regarding Focusrite scarlett 2i2(2nd gen) because i am using windows 8 and i am willing to buy scarlett 2i2 .So shall i buy this or not . I’m tempted to swap my Focusrite Scarlett Studio (Gen 1) for the Gen 2 version, but I’m not sure yet (the 192 kHz sampling frequency is a big seller for me, although I doubt anyone with an iota of sense would go beyond 24/96). Will you link your whole test at this place? I am very interested as I have a maudio c600 right now. Drivers and support are worst, and now the clock seems to be broken. Only works with external clock from spdif right now… Crappie. Yeah, I’ll post it here. You can find it on the front page, also via the site’s RSS feed and emails. I was planning on posting the review this week but I’ve had bad luck with the drivers so I’m going to wait another week to see if the problem gets sorted out. Can someone make the same comparison on Mac OS? Focusrite has a couple of latency comparison numbers for Mac on the Scarlett in Depth page. I have only expierence with 2i2 1st generation and my impressions are too bad! On windows it has bad drivers with too big latency. On mac this situation is better. Also I have clipping on 2i2 on my guitar with DiMarzio steve’s special and paf pro pickups. Also this card could “drop” the sound or have crackling. As I understood with 2nd generation this moment will better? I look in 2i4 2nd generation. Cross finger that card will be better and have better (lower) latency. That’s primarily what I use it for and the latency isn’t an issue at all. 1ms of latency is approximately equivalent to 1 foot. So with 7ms of latency it’s like standing 7 feet away from a guitar amp. Most people are good with under 10 ms of latency but it varies by ear. I doubt 12ms is the overall latency at 512; that’s probably only one way, so the overall is like double that. I recently picked up a 1st gen 2i2 and for some reason thought it was a 2nd gen, and loaded those drivers. 128s was insanely responive for guitar, and it got better all the way down through 16s. I kept it at default 44.khz, and it was silky. But I think it wasn’t stable, because unplugging the 2i2 with PC on (I only have the 2i2 on when recording) started to cause a blue screen error. Hmmm…. In comparison: my Audiobox USB 1.1 is about comparable; though not the best input signal, even with a DI, my Alesis USB 2.0 will go down to 49s without fuss. On input level with the 1st gen: apparently this is a problem even with semi-hot passive humbuckers (both this and a Presonus Audiobox USB 1.1 require the level at 0), an reddit posting saying that they instead switched the input to line, and increased gain till right. I did this, and it gives a smoother, fuller tone. Thing is, the Audiobox is smoother and fuller than that! Weird. I wouldn’t have thought the 2nd gen drivers would work with the 1st gen. It doesn’t work the other way around because I’ve accidentally selected the 1st gen in Ableton setup since they’re called 2.0 but it wouldn’t work. I’ve recently noticed a bug with the 2nd gen that will cause a blue screen if you unplug it with an audio program open, so make sure to close everything first. Yeah, I wondered but didn’t remember whether I’d had my DAW open when I up-plugged the 2i2. Yeah, totally seemed weird that the 2nd gen drivers would work with the 1st gen. The 2nd gen firmware updater wouldn’t see it, of course. I’m also wondering whether the new units are new hardware, or just a (very hush-hush) firmware update? There’s definitely some new stuff under the hood, like the surge protectors and the new instrument input for increased headroom with hot pickups. The converters are different too for the higher sample rate support, and the 2nd gen also works in dual mode now so that it can play two different sample rates at the same time. Very little has changed overall, though. The whole 2nd gen thing probably is half marketing to get more attention with the newer low-latency drivers, but the Solo and 2i2 really did need updating to fix the hot pickups issue. I just got and fired up a gen 2. It is sweeter. Running 16s at 96khz in Reaper on a few-to-several-years old 3.1ghz i5 7×64, and smoooth sailing. Plus I swear the audio out is nicer, whether playing into something like BIAS FX, using my Triple Play and a piano vst (just sounds lusher). Got the gen 2 new for $135 (shipping included) on ebay, too. Diggin it. Forgot to mention some differences/caveats, though. – had to plug it into a different usb port to get input signal to DAW. No idea why, but found a ’13 forum posting saying this is what worked, and is what worked for me. – unit input level seems to vary between vst application: full left is fine for Revalver 4, but BIAS FX needs two 8th turns…..
– master out still has to be cranked to get any volume out of it…..and that’s with my system volume at 67%. The 2nd gen 2i2 is showing up as 12500 at Amazon India. Oddly the 1st gen is priced over 18500. FYI, The converters for the 2nd gen Scarlett has not been changed as they still use the same Cirrus Logic CS4272 multi channel codec converter chips found in the 1st gen Scarlett and Saffire firewire range. The Scarlett 18i20 is essentially a USB Saffire Pro 40. The CS4272 chip is spec’d to handle 24 bit 192k but the implementation of the chip in the 1st gen Scarlett range reduced the performance down to 24bit 96k to cut down on cost and driver performance issues. The Engineering design requirements of the analog circuit of how its implemented, effects the converter chip performance. Small increments changes in the analog design of the pre amps THD+N was reduced using a different capacitor or op-amp. I have a 1st gen 8i6 I just bought last month used from G.C for $100 and I am able to set the Asio buffer to 1ms and it runs smooth on my cheap core i3 laptop…..I seriously doubt it gets any better than 1ms because that’s the lowest setting…..It can handle all kinds of reverb now and not crack after playing a few notes. I recommend any of their products. Thanks for the excellent insights. Question: what about Macs? Since Focusrite recommends class compliant mode (thus, no driver), how is the Mac impacted by 1st gen problems? I guess my bigger question is: what did they change/fix in the hardware with 2nd gen? I don’t use Macs so I wouldn’t know but you can find a list of differences between the interfaces on the main comparison review page. This should help get you started: How to Record and Make Music at Home (For Free, Even). As mentioned in the main comparison review, the reasons to get the 2i4 over the 2i2 is if you need MIDI connectors, the added headphone output, or the extra RCA outs. I think they made it so the 1st gens won’t work with the newer 2nd gen drivers. You’d have to install the older 4.11 driver to get it to work. The link can be found on this comment. Would using a 1st and 2nd gen Scarlett 2i2 at the same time on a Windows 10 PC work? (Running the 2.51 and the 4.12 drivers simultaneously?) My plan is to use standalone plugins within Reason (no VST support) so want 2 separate audio devices. You can use both on the same machine but only one will work at a time. I don’t think it’s possible to have two separate audio interfaces in use at the same time. I’m keen on the 2nd Generation of 2i4 and plan to by it in nearest time, but before I proceed, there is question in my mind. I’m windows user, with windows 8 is it work with 2i4? need your thought and advice on this, really appreciate your time. Thanks! From Focusrite’s website: The Scarlett range is unsupported on Windows 8, though may work. The range is fully tested and supported on Windows 8.1. Thanks so much, appreciate it greatly! have you tested drivers v4.14 if they good or you still on 4.11? And thank you for your articles on Scarlett 2nd gen.
ok i make beats , which one should i get? i just want good quality music …. should i get 2i2 1/2gen or 2i4 1/2 gen? thanks…. It doesn’t really matter, man. You can make good music with any of them, provided you don’t encounter driver issues but that kind of stuff can’t be predicted. This is probably a stupid question but why the latency values are high for higher sampling shouldn’t they be smaller? Just depends on the buffer size. The latency is lower comparatively. unit which they say has little to no latency. kind of hard to believe. Has any one used it? Never heard of it, but there’s no reason to get a 1st gen over a 2nd gen unless they’re giving them away. This information helped me a lot, as a confused new owner of a 2i2 (2nd gen). I just received my unit today and had weird popping and latency issues that seem really random in Live. Surprisingly lowering the buffer and increasing the Hz actually helped me, like you mention. I would like to ask what current settings you use for this interface? I had a Fast Track Pro before this, which gave a warmer/fuller sound I think, but also no popping in Ableton. Unfortunately it’s not supported on W10 so it’s giving me BSOD, so I had to switch to 2i2. Thank you in advance! The performance is going to entirely depend on your CPU and a number of other factors. I have an older i5 and it works great with Live using the 48k 64 samples setting for tracking, even when Ableton’s CPU meter gets above 90% there are no crackles. Then I’ll kick it up to like 256 or higher for mixing. Using the 32 samples setting it starts to crackle some once Live gets above like 35% CPU on my PC.